Girrrl Stop! : Girrrl Stop Running on E! Girrrl Stop Running on E! I had to pick up my aunt from work one day and as usual I was running late. My car’s gas tank was on ‘E’ but I pushed it anyway as not to be even more tardy for the party (yes girrrl I said that lol). After picking them up, we ran into rush hour traffic which caused me to have to detour through the city. By this time, the gas tank was really on ‘E’ to where we were about to have to get out and get to pushin’! At this point I ordered everyone in the car to look for the first gas station There were three stations with the cheapest being the farthest away. I had to go to the first one because I had like 3 miles left til empty! It sucked because the first gas station was the highest priced one, but I had to take the first thing I could get. Girrrl, don’t let this be your dating life! Many times when we are running on empty or deficient in some areas of our lives it causes us to make thirsty decisions. We feed into loneliness and let it push us toward choosing the first gas station we come to. Fill yourself with the things you need so that you are not desperately searching for others to fill you. For one, that’s way too much pressure for any man to fill you with what you are lacking, let Christ fill you with what you need! You need love? Love yourself. No one can effectively love you if you don’t love yourself. Know who you are in Christ and believe who He says you are! When you master this thought pattern in your life, you’re less likely to settle and accept treatment beneath who you are. You need to feel connected? Get out and socialize! Get busy!! Create the life you want to have so when the man comes along, he can focus on complimenting your already great life, not trying to fill something he’s unable to. You’re feeling lonely? It happens to all of us but I encourage you to begin to enjoy your own company! If you don’t enjoy being around you, why would someone else? In those times where you can’t push through, remember what God said in his Word, “…Lo, I am with you always, even to the end of the age” (Matthew 28:20b) - you are never alone! Sometimes God wants to commune with you, girrrl enjoy this time with Jesus Christ because He does indeed call you friend! Girrrl Stop running on E! 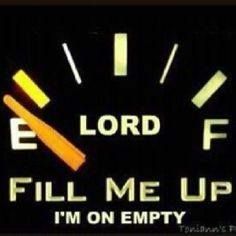 Be filled with the things of Christ and those things that interest you so you don’t stop at the first gas station you come to! !